It's Time to Get Money Out of the U.S.
You aren't going to like what I have to say today. It's not the kind of message an audience full of American readers wants to hear. Today's idea fights a major bias built into every investor. But if you ignore what I share, and succumb to this bias, it could cost you dearly in the years ahead. Your money is better off outside the U.S... at least over the next decade. It's tough for a lot of folks to get behind this idea. Investing outside the U.S. might seem downright un-American... And it sounds crazy, now that we've seen U.S. stocks go up for a solid decade. But right now, we're seeing a rare opportunity that could lead to massive gains outside of the U.S. So in DailyWealth today and tomorrow, I'm covering the details. As I'll show, two major catalysts are setting up... pointing to major outperformance in a certain area of the world. And that's why I believe it's a smart move to shift some money out of the U.S. and into this space today. If you want to make the biggest potential gains in the years to come, you need to look outside of the U.S. You need to look at Europe. A setup this powerful doesn't come around often. But when it does, you have to step up to the plate and take advantage of it. Today, in Europe, we have a once-a-decade opportunity to do just that. Every month, Bank of America Merrill Lynch releases its Global Fund Manager Survey. This report tracks the views of approximately 200 institutional, mutual, and hedge-fund managers around the world. Fund managers have named bearish bets in European equities as the "most crowded" trade in Bank of America Merrill Lynch's survey for the first time in its history. Global investors haven't just given up on European stocks. They're betting against European stocks at a record level. Investors have never hated an asset this much in the entire history of this survey. Stocks suffered their worst December since the Great Depression. 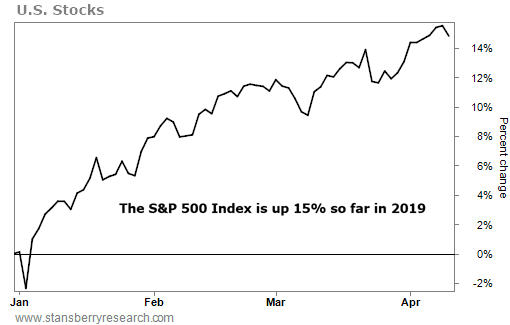 The benchmark S&P 500 Index fell 9.6% during the month. And stocks lost money on the year as a result. It was the first losing year since 2008. Investors were giving up in droves. The crowd assumed the bad times would continue... And they began pulling money out of stocks. According to analysts at data and analytics firm Refinitiv, investors pulled more than $46 billion out of U.S. equity mutual funds and exchange-traded funds in early December... all in just one week. That's the biggest one-week outflow that Refinitiv has ever recorded. The S&P 500 bottomed on December 24. And the best January for U.S. stocks in 30 years followed. I tell you this because the crowd is betting against European stocks to an even greater extreme right now. Investors hate Europe today... more than they've hated any other market in the history of the fund managers survey. And history says big gains are likely as a result. Now, this extreme sentiment tells us that a reversal is certain in European stocks. But it doesn't tell us what kind of returns to expect. There's another indicator that does just that, though. I'll share it with you in tomorrow's DailyWealth essay... along with a simple way to profit. "If you've stayed on the sidelines, you might think it's too late now," Steve says. "It might be hard to believe... But no, you didn't miss it." Learn more about the upside ahead in another market outside the U.S. right here. "Fear of investing in foreign markets has a name. It's called 'home-country bias,'" Brett Eversole writes. "I urge you not to succumb to it today." A recent rare event could set up big gains in this surprising foreign market... Get the full story here. Planet Fitness (PLNT) boasts about its “Judgment Free Zone,” where you don’t have to be buff to feel like you belong. Combine that with its starting rate of just $10 per month, and it’s no wonder this gym chain has won over more than 12.5 million members. 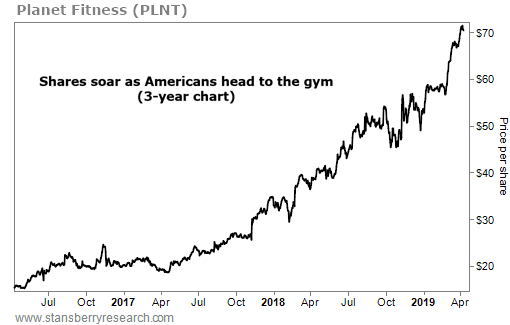 And it’s expanding its reach… Planet Fitness raked in $573 million in sales last year – a 33% gain – thanks to 230 new locations and double-digit same-store growth.